Vegan sushi bowl meal prep has all the flavors of sushi without the rolling! Four vegan lunch recipes ready in just 25 minutes. After posting this Egg Roll In a Bowl last month, it got me thinking about other recipes that we can make easier by just serving up in a bowl! And the first thing that jumped into my brain was sushi. We are big sushi fans, but our attempts at homemade sushi were less than stellar. My seaweed always seems dry, chewy and just not right. We’ve really reserved sushi as an ‘eating out’ option. 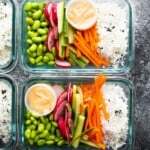 But today’s vegan sushi bowl meal prep recipe proves that you can still enjoy the flavors of sushi, without needing to roll anything at all! 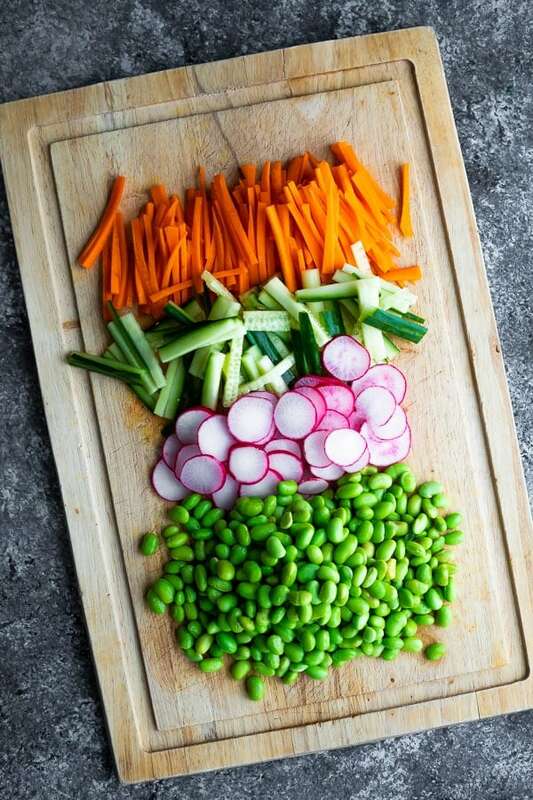 Veggies- I used radish, carrot and cucumber. To store your cucumber for 4 days, you may wish to slice in rounds (it will stay more moist that way). Edamame- I used frozen, shelled edamame. Simply thaw it out. Sriracha mayo- mix together sriracha with vegan mayonnaise. An alternative that would also be delish would be to add wasabi paste to the mayo instead of sriracha! Do I serve these sushi bowls warm or cold? COLD! This is a great option if you don’t have access to a microwave! Can I add salmon to this recipe? Yes, however I would recommend adding smoked salmon over raw salmon, unless you know you have sushi-grade salmon and that it’s safe to store for 4 days. Can I swap the veggies? Absolutely! 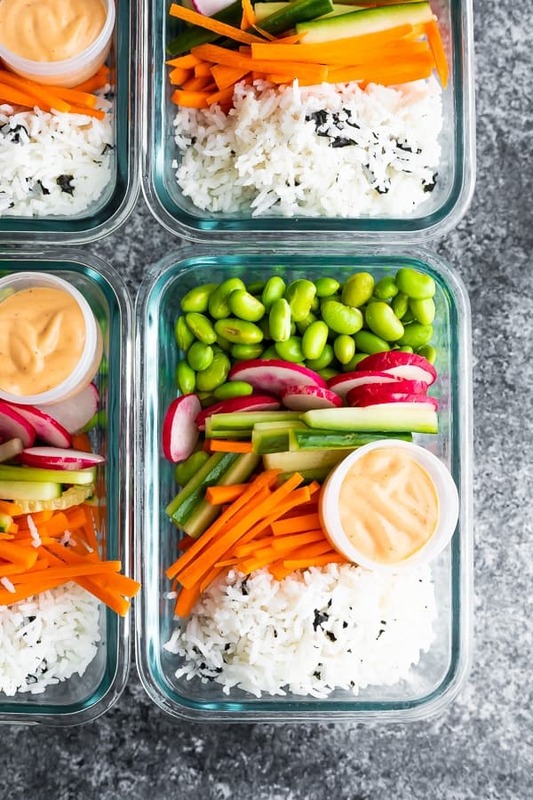 You could pretty much add any hardy veggie to these sushi bowls. Broccoli, cauliflower, and bell peppers might be good options. Looking for more vegan meal prep recipes? 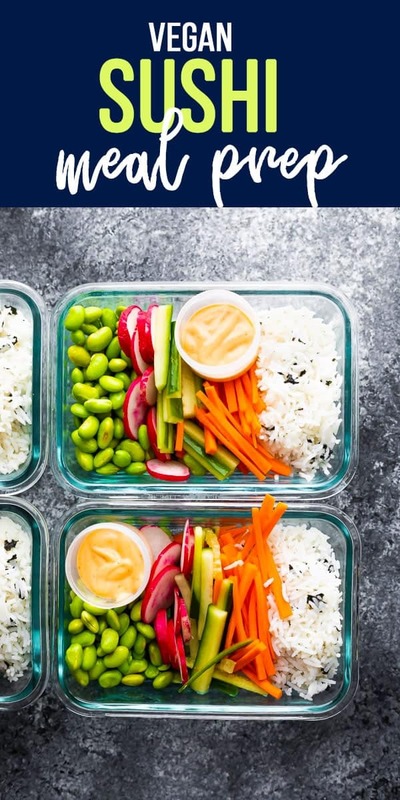 Check out these Spicy Tofu Noodle Bowls, these Roasted Veggie Meal Prep Bowls with Turmeric Tahini Sauce, and this round up with more than 65 Vegan Meal Prep Recipes! 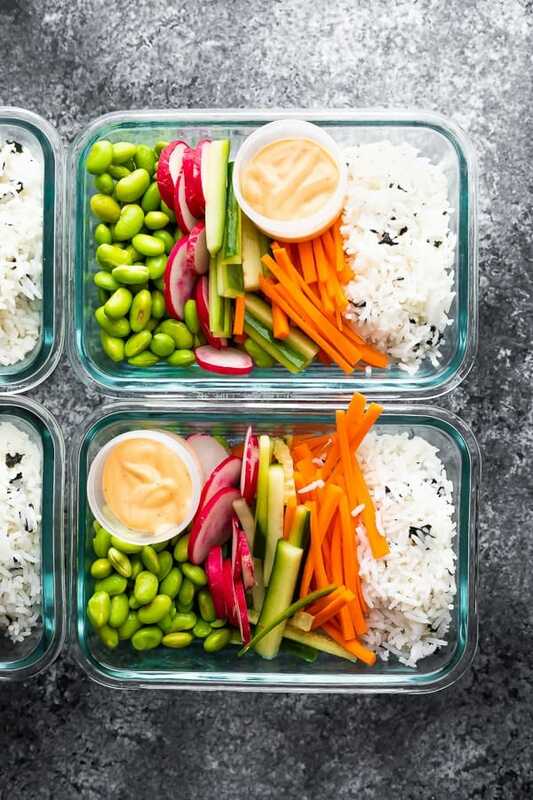 Toss cooked rice with rice vinegar and seaweed, then portion out into four 2-cup capacity storage containers. 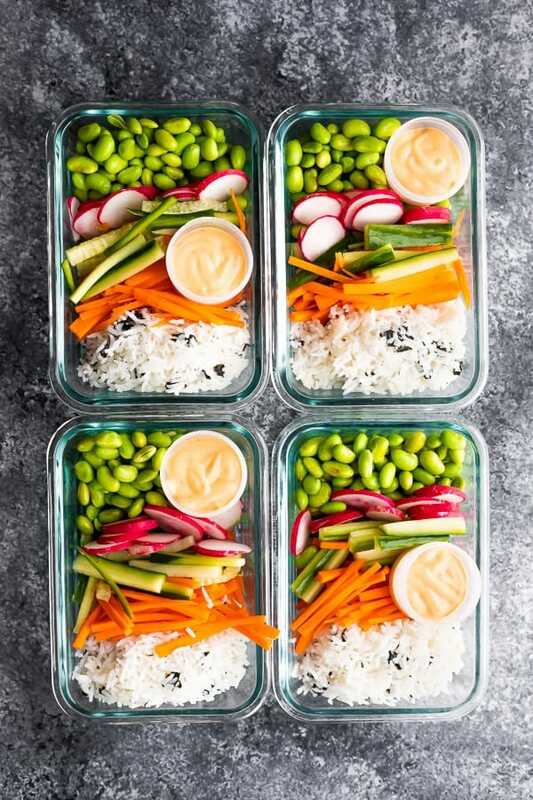 Portion out edamame, radishes, carrots, and cucumber between the meal prep containers. In a small bowl, stir together the mayo and sriracha. Portion out into condiment containers. To serve, toss everything up with the sriracha mayo and enjoy cold.